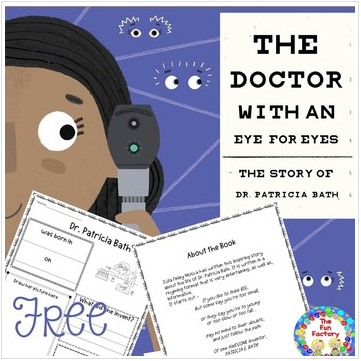 Julia Finley Mosca has written this inspiring story about the life of Dr. Patricia Bath. It is written in a rhyming format that is very entertaining, as well as, informative. Patricia Bath fought and succeeded against all odds – making it her life’s mission to work for the treatment and prevention of blindness. This 6 page freebie gives you a summary of Dr. Bath’s life and 2 pages to record some details. Images created by Daniel Rieley are used with permission from The Innovation Press. by clicking the star above to receive notices of new products. Visit our blog at The Fun Factory Blog. By downloading this product you are agreeing that this item may not be resold since the purchase includes one license, for one teacher or classroom and does not include the copyright. All copyright remains with the original author/creator, The Fun Factory. You May: Use this product for only your classroom. You May NOT: Claim this work as your own. Sell this product or share this product with others.